Composite Index lost 0.1%. The Dow industrials and the S&P 500 broke yearlong droughts to reach new highs this week, a sign that U.S. stocks are relatively appealing even as investors grapple with concerns about the global economy and the shakeout from the U.K.â€™s vote to exit the European Union. 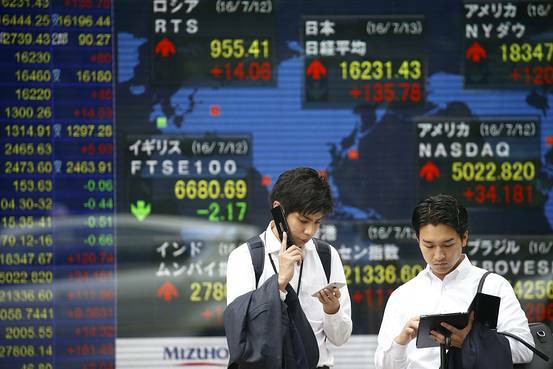 Trading was choppier on Wednesday, as stocks alternated between slight gains and losses. â€œThe tone weâ€™re hearing is not so much the desire to be fully exposed to U.S. stocks as much as it is the fear of being underexposed and missing yield,â€ said Larry Weiss, head of trading at Instinet. â€œWeâ€™re not seeing the most committed effort to going long.â€ For indexes to keep pushing higher, some said they were waiting for a reversal of bets on havens, or signs of improvement in corporate earnings, which are expected to fall for a fifth consecutive quarter, according to FactSet. â€œTo see how quickly the U.S. market bounced back after Brexit was a bit of a surprise,â€ said Thomas Wilson, a senior investment manager at Brinker Capital, of stocksâ€™ record-setting streak. Government bond yields, which have fallen in recent weeks as investors sought havens, declined again. Germany on Wednesday became the first eurozone state to sell 10-year debt at a yield below zero. In Switzerland, government bonds through the longest maturity are also yielding less than zero. The yield on the U.S. 10-year Treasury note fell to 1.468%. Gold prices rose 0.6%. U.S. crude oil fell 4.5% to $44.71 a barrel after federal data showed U.S. inventories of crude oil and refined products at a record high. The drag on oil prices pulled down energy shares in the S&P 500, making it the worst-performing sector with a decline of 1.3%. In the U.K., David Cameron made his last appearance in Parliament as prime minister, leaving Theresa May to take over as the U.K.â€™s new leader. The British pound, which was in the firing line after the U.K. referendum, declined 0.8% against the U.S. dollar at $1.317. The Stoxx Europe 600 fell 0.1% after fluctuating between gains and losses in earlier trade. Some investors foresee further uncertainty ahead. â€œBrexit is still a live risk that markets seem to underestimate,â€ said Nick Dâ€™Onofrio, chief executive of London-based North Asset Management. â€œIt will lead to a slowdown in the U.K., which will spill over to Europe.â€ The Bank of England meets on Thursday and analysts expect it to lower its benchmark lending rate by a quarter of a percentage point to 0.25% to counter the fallout from the Brexit vote. BOE Gov. Mark Carney has already announced that the central bank was on hand with at least Â£250 billion ($331.18 billion) in funding for any banks that needed it. The BOE also loosened bank capital requirements to support lending. Many investors expect other major central banks to also act to counter a potential drag on the global economy after the Brexit vote, with some predicting further stimulus from the European Central Bank and a further delay to the U.S. Federal Reserveâ€™s plans to raise interest rates this year. â€œCentral banks donâ€™t have a choiceâ€”if they withdraw their support now, this will be a massive hit to sentiment,â€ said Eoin Murray, head of investments at HermÃ¨s Investment Management.